Vote IV: A New Hope? On the heels of Sunday's Hall of Fame induction ceremonies, the Hall's board of directors voted to "revamp its procedures for the Veterans Committee but won't rule on players again until 2009," reports Chris De Luca in the Sun-Times. After three consecutive votes by the committee failed to result in the election of a former player, the Hall decided to restructure the process. The change unveiled Saturday calls for three separate ballots -- one for players, one for managers and umpires and one for executives. Meanwhile, a special committee will review pre-1943 players. Beginning in 2008, the Veterans Committee will hold elections for managers and umpires every other year. Beginning in 2009, the election of long-retired players such as Santo will occur every other year -- meaning the veterans will be voting on something each year. Details for executives still are being worked out. Also, only the 63 living Hall of Fame members will vote on players. The group previously had numbered more than 80 because Frick and Spink award winners (writers and broadcasters) were allowed to vote. In January I spoke to Bob Feller about this very topic, and his solution was far more drastic: lower the standards. Granted, that statement did come from the same man who believes Riggs Stephenson has a better chance of election than Santo, but it still stinks of elitism and degradation. "It's too bad you aren't quite good enough to get in," he seemed to say. "Here, we'll give you poor souls a hand." I'm glad it didn't come to that, and I think the committee will fold before they lower their supposed "standards." Santo, meanwhile, was hoping the committee would vote every year, reports the Tribune. "This, to me, is nothing," the Cubs broadcaster said. "It's [voting] every year that needs to be the change, for the veterans, guys who are getting older and may not be around in two years. If it's every year, at least you feel like you're moving up the ladder. In two years, I don't know where I'm going to be." "This year I was five votes away, and Gil loses even more votes, as did Jim Kaat, who also should be up there," he said. "My point is that every two years, you don't know what's going to happen. Also as part of the changes, the ballot for players will include only ten candidates. Whether this will suddenly make veterans vote for people that they've repeatedly not voted for before is the real issue here. It may very well work, putting more focus on a select group of former players, but if you've got your mind set on not voting for certain people, will a smaller ballot really change that? Despite last night's rather ugly loss - hey, they happen to the best - the Cubs are sitting pretty, two games behind Milwaukee in the Central and one behind Arizona for the Wild Card. Yes, unbelievable as it is, the Wild Card may come out of the Central, a division so putrid a season ago that the words "NL Central" and "Wild Card" weren't even spoken together in a paragraph, let alone a sentence. But what a difference a year and $300 million make. Lost amid yesterday's beatdown was a momentous milestone: Jason Kendall's first extra-base hit as a Cub. His double in the fifth was also his first extra-base hit in two weeks. After six games and 19 at-bats, the Cubs' newest weak-hitting catcher has three hits. Derrek Lee continued his methodical march to a double-digit home run total with a solo shot in the sixth that gave the Cubs their only run of the night. He's now got nine for the season. Cub pitchers had done a nice job of containing Albert Pujols - until yesterday, that is. He was 0-9 in the first two games of the series before breaking out for a home run and five RBI in the finale. Surprisingly, Pujols was 0-9 despite no strikeouts. He wasn't getting overpowered, but was contained (again, until yesterday) none the less. The Cubs head to Cincinnati to face a Reds team that just took two of three from Milwaukee. They're still 15 games under .500, but the Reds have held their own against the rest of the Central, with a record of 20-23 in intra-divisional play. Bronson Arroyo pitches tonight for the Reds; his 3.07 career ERA against the Cubs is tempered somewhat by a ERA of nearly six at home this season. But the pitcher to watch out for is Aaron Harang, 10-2 on the season with an ERA of 3.45. His last outing, on July 23 against Milwaukee, was incredible: 10 IP, 1 ER, 0 BB, 10 K.
The Cubs will promote shortstop Ronny Cedeno from Triple-A Iowa on Tuesday, and he's expected to be available for the opener of the three-game series in St. Louis. Cedeno, who hit .097 in 14 games after starting the season with the Cubs, is leading the Pacific Coast League with a .360 average and has 10 home runs with 32 RBIs in 65 games at Iowa. Oh, the memories, the cursed memories! His minor league numbers do little to cleanse my palate of that bitter 2006. And that season came after he batted over .350 for Iowa the year before. I suppose everybody deserves a second chance, but still ... .245/.271/.339 in over 500 at bats remains etched in my brain. Ron Santo made, for once in his lifetime, a valid point on the radio last week. He correctly stated that the Cubs, with all their roster changes and rapid season turnaround, have hardly had to go outside the organization for players. Every pitcher on the current staff either began the season with the Cubs or a minor league affiliate; of current position players, only Jason Kendall was brought in from outside. That simple fact speaks volumes about the depth and quality of the Cubs as an organization, and of the people running it. When a player has hit the DL or performed below expectations, the Cubs haven't had to make a panic trade that sacrifices good, young players to fill a gap  Jim Hendry has been able to send those good, young players up to the majors instead. It's been years since the Cubs had such organizational quality; last season, the Cubs had to reach deep into the minors, but most of the rookies flopped, hence the last place finish. Not so this year, when the likes of Sean Marshall, Carlos Marmol and Mike Fontenot have all done admirably. Billionaire real estate investor Sam Zell was viewed as a savior in some quarters last spring when he swooped in to orchestrate an $8.2 billion buyout offer for Tribune Co. amid tepid interest for the ailing newspaper publisher. Now the industry's accelerating decline has some Wall Street experts wondering whether the deal for the parent company of the Chicago Tribune, Los Angeles Times and Chicago Cubs could fall apart. Kicking off a three-game series in St. Louis tonight, the Cubs will face a team that has been bad all season long. Only Philadelphia has a higher team ERA, and the Cards have surrendered nearly 100 more runs than the Cubs. A World-Series-winning team  or playoff-reaching team, for that matter  this is not. Tonight's starter, Kip Wells hasn't won against the Cubs since 2003, though he did manage eight shutout innings against Florida in his last start. Zambrano is going for his 13th win of the year. It really says something about the caliber of a team when it can come together after a tough loss to absolutely demolish its opponent the next day. Earlier in the season, this club would have stumbled after a loss, losing confidence as it fell further from contention. But remarkably, the Cubs haven't lost two consecutive games in nearly a month, despite several losses that I'd rather forget. The Cubs, though, seem to do just that  forget  and focus on the game at hand, on winning the game at hand. But all that aside, it just feels so good to absolutely dominate another club, even if that other club is one of the worst in the league. Carlos Zambrano keeps pitching like the man on a mission that he is; if that mission is to make as much money as possible, to win a World Series, or both, I can't say, but do I really care so long as he keeps pumping out win after win? And if Carlos' ERA keeps dropping like it has the past few weeks, he very well could win that Cy Young award he's coveted for so long. "I felt very confident with him back there," reliever Michael Wuertz said. "He handles the ball real well. He really makes you bear down. He's really smart back there, there's no doubt about it. "I think there's some good things you're going to see with him working with the pitching staff." Good to hear, though Koyie Hill may have earned himself some more playing time after last night's offensive bonanza. 1:20 game today, Ted Lilly vs. Matt Morris. What Is It You're Paid To Do, Again? You know what the Cubs really need? A left-handed reliever who can actually throw strikes. Yes, Will Ohman, I'm talking to you. That is all (for the moment). Many months ago  in January, to be exact  Lou Piniella, attending his first Cubs Convention, made quite a statement, about his intentions and demeanor, when he said, "It's time to bring some swagger back to Chicago." It took a few months of play, but Piniella's done it: He's turned a lackadaisical organization seemingly content with ticket sales and spreading the Cubbie brand into a team with a burning desire to win, no matter the inning or deficit. Cubbie swagger, indeed. As was evident over the weekend and last night, this is a Cub team that will not give up. The hero seems to change every game, too, be it a player big (Ramirez) or small (Theriot). If A's fans are "very happy" about the trade of Jason Kendall, I should be sad, shouldn't I? Instead, I'm ambivalent. Kendall's been atrocious this season  but the Koyie Hill/Rob Bowen/Geovany Soto combo certainly hasn't been any better for the Cubs. Now, if this is Hendry's idea of a big, pull-out-all-the-stops-because-we're-going-to-win-this-thing type of deal, then I'll be a tad more upset. Until Larry Rothschild came out to the mound yesterday to talk to Rich Hill, I hadn't really thought about the Cubs' pitching coach in some time. With the starting staff doing so well, there's been no need to point fingers. But that's how just about everything works: If you do a good job, it often goes unnoticed; you mess up, and suddenly everybody has their eyes on you. So I can't help but wonder: Just how much of the Cubs' pitching success is due to Larry? Marquis' turnaround, the emergence of Marshall and Marmol ... is it all Larry's doing? Not long after Lou Piniella made clear his desire for a right-handed batter, Jim Hendry obliged, calling up catcher Geovany Soto from Triple-A and demoting struggling center fielder Felix Pie. With the Cubs now carrying three catchers, another roster move may be in the works, perhaps to replace Koyie Hill with a 12th pitcher, another item on Lou's wish list. In other news: Mark Cuban's interested in buying the Cubs, says the Associated Press. Say what you will about the man's antics, but he wants to win, and that is never a bad thing. On pace for a career year, Ted Lilly has been outstanding, aside from a rough patch in late May and early June. He's striking out a lot of batters, walking very few, and keeping the ball in the ballpark at a rate better than that of any other season. So far, Lilly is shaping up as a great signing. Based on results alone, it's hard to believe this is the same pitcher who finished 2006 with an ERA over six. Marmol's stuff was always good, but out of the bullpen it's been explosive. And the poor control that plagued him as a starter appears mostly resolved (10 BB vs. 40 K). The Cubs' closer of the future? Ok, I'll admit it: I've been flat out wrong about Marquis. He's had a few bad starts, as even the best do, but Marquis has been one of the team's most dependable starters, solid if unspectacular. He's still not striking out batters (62 in 105.1 innings), but that hasn't hindered his success. Like Marmol, Marshall has blossomed in his sophomore season, one of the few good things to come out of a disastrous 2006. After hurting his arm early in the year and toiling (and dominating) in the minors for several months, Marshall has thrown quality starts in six of his nine starts. After a 2006 that looked very much in line with his career numbers, Dempster has rebounded nicely in 2007. He's back to striking out nearly a batter per inning, the Cubs' closer is walking the fewest batters per nine of his career, and his WHIP has never been lower. 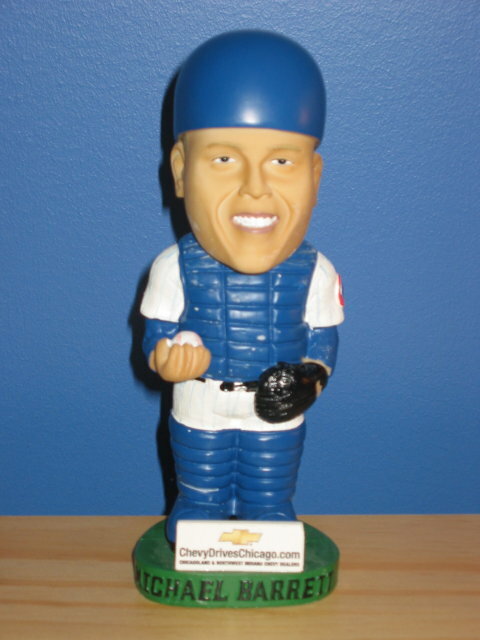 After strong performances during the 2006 season (Double-A) and the Cubs' 2007 spring training, Cherry made a name for himself in the organization. When he's been healthy, he's done well  though not without a few hiccups. Still, his first-half performance certainly is a pleasant surprise from a 28-year-old that had played in only two games above Double-A at season's beginning. Despite an outstanding June and early July, Zambrano is still a slight disappointment. He was expected to be the Cubs' top pitcher, and for the first few months of the year, he wasn't. His walk rate is down, but so are his strikeouts. His home runs allowed and batting average against are up. A half-season of a bipolar Zambrano was not the expectation for a pitcher who wanted $100 million this spring. When Guzman has pitched, he's done fairly well, with a few good starts and relief appearances. The key there being "when." With just over 30 innings on the season, Guzman still hasn't shown he can avoid the injuries that slowed his ascent to the majors. It doesn't matter how much talent you have  if you can't stay on the field, it's irrelevant. Just ask Mark Prior or Rich Harden. Eyre's 2006 season + Eyre's 2007 season = disappointment. Enough said. Miller had a decent spring after a not-so-decent 2006. Most fans figured it would only be a matter of time before Miller played himself out of the rotation and let Angel Guzman in. In fact, not even the harshest prediction (ZiPS, in this case) thought Miller's ERA would be over five. Instead, Miller lasted three starts, then (thankfully) hit the DL. Disappointing, even by the lowest of standards. Hill has had his ups and downs, but the lanky lefty has largely been a sturdy presence in the Cubs' rotation. And, after an impressive second half in 2006, that should come as no surprise. Only Ted Lilly has a higher VORP among Cub pitchers. With 41 games under his belt in 2007, Wuertz has matched his appearance total from 2006. And, with the exception of ERA, he's duplicated that performance in nearly every way: Hits (35 in 2006 vs. 34 in 2007), home runs (5 vs. 5), walks (16 vs. 18), strikeouts (42 vs. 35), WHIP (1.25 vs. 1.31), batting average against (.226 vs. .227). Nothing surprising or disappointing here; Wuertz is one of the team's most dependable relievers. Thanks to a recent strong showing after early-season struggles, Ohman has an ERA nearly identical to the one he posted in 2006. Nobody expected greatness, only a bearable left-handed arm  and that's what the Cubs have gotten. Cotts was bad in 2006 and, surprise, surprise, was bad in 2007 before being banished to the minors. Not that acquiring Cotts really cost the Cubs anything; David Aardsma, whom Cotts was exchanged for, played even worse. Playing all over the field, DeRosa has still managed to essentially repeat the stats he posted in 2006, which many, myself included, thought were career highs he'd never again approach. No other Cub batter has been as surprising as Fontenot. He's hit safely in all but five of the 28 games he's played in, and he leads the team in slugging and OPS. Will it last? No, but he's been a very pleasant first-half surprise and undoubtedly important to the Cubs' recent success. Ward was expected to do little else than spell Derrek Lee from time to time, but has instead been one of the Cubs' most dependable hitters with men on base, and his OPS is nearly 100 points above his career average. Oh, Michael. You were one of the top offensive catchers in the league, your defense bad but tolerable. And then 2007 came about. Mighty struggles in every facet of the game culminated in a dugout/clubhouse fight and subsequent trade. Disappointing doesn't even begin to describe you. Everyone's favorite redhead was never really given a real shot, shuffling from outfield corner to corner and up and down the lineup. Still, when he did play Murton was far from impressive, even if we exclude his defensive woes. What happened to the OBP machine with moderate power? Blanco's season has been marred by injury, robbing the Cubs of a dependable and experienced catcher who hit for an OPS of .723 in 2006. He's been brilliant at times and pitiful at others, adding up to disappointment for the Cubs' top prospect. But at 22-years-old and with scarcely 100 major league at-bats to his name, he's got nothing to be ashamed of; he'll only get better. I had some pretty low expectations for Cedeno – I think I stopped just short of calling him the Bane of Mankind – but even I didn't predict badness like this. Three hits, two for home runs, and strikeouts in a fourth of his at-bats. He's tearing up Triple-A, but remember, he hit over .350 in 65 games at Iowa in 2005, then hit .245 with the Cubs in 2006. He's hardly played enough with the Cubs to warrant any kind of judgement, but he's got to go somewhere. And with 11 strikeouts in his first 27 Cub at-bats, into the disappointment category he goes. But that could very well change in the second half. Jones, whom the Cubs are actively trying to trade, hasn't done much to make himself a wanted commodity. He's well on his way to establishing new lows in nearly every offensive category. Even after a slow start, he's got the highest VORP on the team. He may not hit 40 home runs again, but he's done everything asked of him, including moving from left field to center and back again. Resigning Ramirez may very well have been the best move Hendry made over the winter. Consistency, thy name is Ramirez. Theriot hasn't been spectacular, but his versatility and hustle are added bonuses to mediocre stats. He'll never be an All-Star, but that's never been an expectation. Floyd wasn't signed as a starter, so his meager contributions, highlighted by a general lack of power, were to be expected. He is what he is: An aging outfielder whose best years are behind him. Very nearly the definition of mediocre (and oxymoron, for that matter), Pagan has been serviceable as a late-inning defensive replacement and switch-hitting bat off the bench. When a player has an OPS of .592, and the fans are content with his production, saying, "Well, what else did you expect?" you know he's pretty abysmal at the plate. In fact, this season's offensive production is actually an improvement over 2006 for Izturis, if that's even possible. With Barrett traded and Blanco incapacitated, Hill has done just what everyone thought a 28-year-old catcher who last played in the majors in 2005 would do: Catch the ball. And really, that's all the Cubs need him to do; any offense that the Bowen/Hill catching combo produces is icing on the cake. I really, really hate to peg Lee as a disappointment – he is batting .330; we're not talking about Ty Cobb or Rogers Hornsby here – so he gets a category of his own. His batting average and OBP are hardly surprising after a breakout 2005, but his lack of power is. I wasn't expecting 50 homers – I doubt anybody was – but nobody, not even Lee himself, was expecting a mere six. Hence, the category title. His disappointing power is a surprise, but his surprising lack of power is a disappointment ... Ok, I think I'd better stop now. After playing so poorly during the first few months of the season, the Cubs have experienced quite a reversal in fortune. A team that was half a dozen games under .500 just one month ago has since pulled itself up from the realm of Bad to the sacred, more fan-friendly land of Contenders That Need Solid Second Halves. So I'm actually quite pleased. Another rough day scoring runs, in particular against a left-hander, has the Cubs looking even a little harder at trying to add a right-handed hitter to the roster before they resume play Friday. "[General manager Jim Hendry] and I will talk during the All-Star break," manager Lou Piniella said, "and see if we can look at the possibility of getting a right-handed batter in here so it can help us out against left-handed pitching." Whether this batter arrives by trade or the minors isn't made clear. Jacque Jones will be traded eventually, that much is certain  where to is another story  but will he yield said right-handed batter? Perhaps a right-handed batter, but most likely not one of significance or great value. As for the minors, the only plausible candidate (Ronny Cedeno does not count) is Matt Murton, currently hitting .299/.380/.506 at Iowa. My guess: Unless Hendry pulls off an unexpected trade for a top-notch righty, Murton will be Lou's right-handed batter. So my question to you today is: What is the Cubs' biggest need for the second half? Is it a right-handed batter, or something else? You'd think I'd be disappointed about Carlos Zambrano not being voted to the All-Star game (although, because so many players opt out each year, I suppose he still has a shot), but honestly, I'm much happier with a nice long rest for the big man's heavily-used arm. Historically, he's been better (3.44 ERA vs. 3.28 ERA) after the All-Star break, but a little rest for a 26-year-old with over 1000 career innings certainly isn't going to cause any harm. I wish I could tell you that all is well in Cubdom, with the squad over .500 and riding a hot streak. Take Rich Hill, for example. It's been nearly a month since he last won a ballgame, and in three of his last four outings the lanky lefty has surrendered five or more runs. Whatever the reason, be it the longball or small strike zones, he hasn't done much good as of late. The point being: This team is far from perfect, and it's unreasonable to expect the Cubs to keep winning 11 of 13. Not that that simple fact takes anything away from what the Cubs have managed to do, pulling themselves into contention and within 4.5 games of Milwaukee. And perhaps, in light of an inevitable slowdown, we should bask in the present good times all the more; eat, drink and be merry while there is still something to be merry about, so to speak. Before you call me overly pessimistic, consider this: While the Cubs will eventually slow down, the team's rather soft July schedule means that they probably won't shift down more than a single gear. Consecutive series against Pittsburgh, Houston and San Fransisco should have the Cubs licking their lips. The only July opponents with records over .500 are Arizona and Philadelphia. The Sun-Times' Greg Couch, who has never struck me as an especially good columnist, has a pretty bizarre column today, in which he asks the Sox' Jim Thome and the Cubs' Derrek Lee whether they watch the ball hit the bat. Conventional baseball wisdom says yes, but the players said no  which, frankly, I find hard to believe. For baseball players, watching the bat hit the ball is something that has become so quick, natural and automatic that I doubt the players really realize they're doing it. Like tying shoelaces or buttoning shirts or pants, it just gets done mindlessly. Photographic evidence would seem to support my claim. Hitting a speeding baseball is a difficult task even if you are watching the ball; add in breaking balls to contend with, and watching the ball becomes mandatory. It's still far to early in the summer to be doing any serious scoreboard watching, but it sure is nice to see Milwaukee lose. Unless St. Louis has a miracle run stored up somewhere in its brittle, mediocre bones, Milwaukee stands alone as the Cubs' only obstacle on the road to the Central title, so a Brewer loss is always a welcome sight. Why can't the Cubs play like this every day? Solid starting pitching, lights-out bullpen work, an offense that actually scores runs... That is a guaranteed recipe for success. I made the trip out to Wrigley for Sunday's game per an invitation from a friend with an extra ticket. The weather couldn't have been better: A cool breeze tempering the heat of the sun. A beautiful day in Chicago made all the better by a Cub victory. We arrived at the park early, even before the gates had opened, and doodled around in line while waiting to get in. There were quite a few Brewer fans amid the waiting throng (more on that in a minute). And as if going to the game wasn't pleasure enough, what do I receive upon walking through Gate K? An exclusive, limited-edition Michael Barrett bobblehead doll (in home uniform)! Don't you just love planned giveaways? The game was a quick one; I kept looking at the scoreboard clock in astonishment as the innings flew by. Marquis, in particular, was really dealing – especially early – and the electric Marmol struck out four in closing out the last two innings. The only thing that really marred the day was a pair of Brewer fans sitting about three rows in front of us – and even so, the comedy all but made up for it. They started out well enough, with pointed heckling of nearby Cub fans that actually had merit. But before long, the beer men made their way to our section, and their commentary devolved into a lot of yelling and, as the game slipped away, cursing. Before long, the crowd was pretty fed up with the drunk pair, and their brilliant idea to get back in its graces was to buy beers for random women. As the first recipient quickly turned down the offer, then cash, then a date offer, the Cub fans let them have it. "Say no to dairy!" and "Rejected!" cried the fans, as the two returned to their seats, disgraced. And so the Cubs took two of three, making a bold statement to the Brewers and the league: Watch out. And with a very soft July schedule, as the venerable rynox pointed out in the comments yesterday, the Cubs have a great opportunity before them to be sitting pretty come August. Perhaps not first place, but certainly within striking distance of the playoffs.